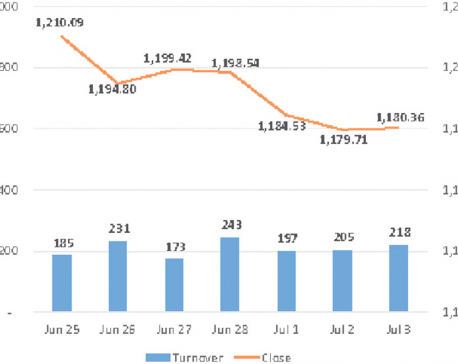 KATHMANDU, July 26: The stock witnessed a choppy session on Wednesday. The benchmark Nepal Stock Exchange (Nepse) index traded flat in the first trading hour. The index failed to cross the 1,200-point mark and declined later in the session. At the end of trading, the index dropped by 4.92 points to close at 1194.35 points. 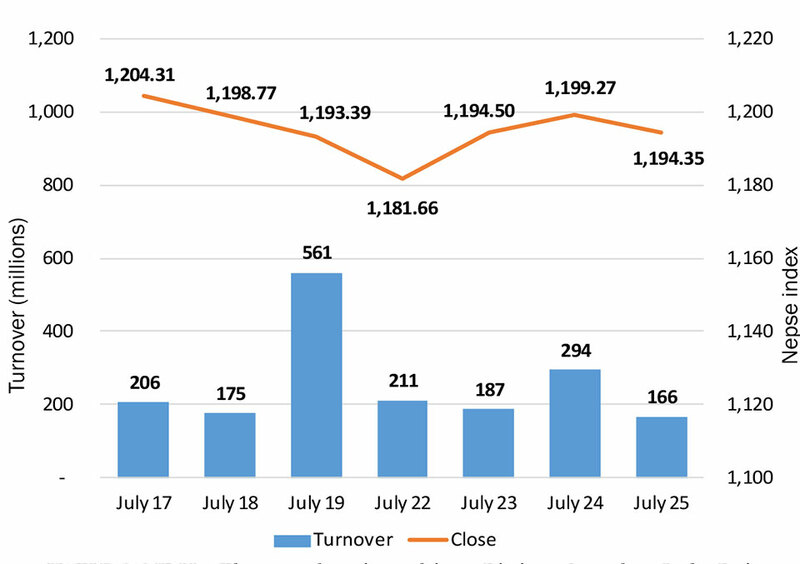 Trading activity remained subdued as the stock market registered a decline of more than 43 percent in terms of total turnover. Over Rs 166 million worth of shares were traded in the bourse on Wednesday. This shows that investors tried to book profits on the day. Major sub-indices posted decline, albeit marginal. Strength was visible among hydropower stocks as its sub-index rose by 0.27 percent. The Manufacturing & Processing sub-index also ended the day in green. On the other hand, non-life insurance stocks were on pressure as Non-life Insurance sub-index dropped 1.33 percent. Hotels, Finance, Life Insurance, Microfinance and Banking sub-indices also finished lower. 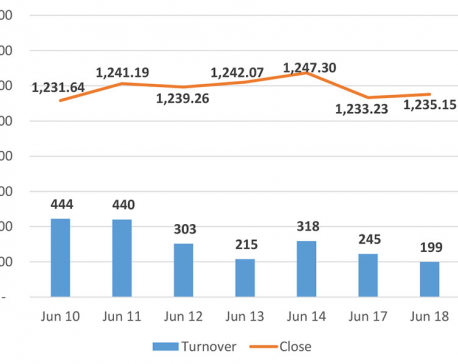 In terms of market activity, Nepal Credit and Commerce Bank Ltd logged the highest turnover of the day as Rs 10 million worth of its shares changed hands. Furthermore, Nabil Bank Ltd Promoter shares, Nabil Bank Ltd, Sanima Bank Ltd and Prabhu Insurance Ltd recorded turnovers of over Rs 6 million each. Naya Nepal Laghubitta Bikas Bank Ltd, Nepal Life Insurance Company Ltd and Chilime Hydropower Company Ltd were the other active stocks on the day. Support Microfinance Bittiya Sanstha Ltd was the biggest gainer of the day as its share price surged 9.96 percent. Shares of Nepal Seva Laghubitta Bittiya Sanstha Ltd, Rairang Hydropower Development Company Ltd and NMB Sulav Investment Fund also jumped over 4 percent each. On the contrary, NIBL Pragati Fund unit recorded the worst performance of the day as it share price declined by over 5 percent. Next on the list was Shrijana Finance Bittiya Sanstha Ltd which saw its share price fall by 4 percent. Shares of Sana Kisan Bikas Bank Ltd, Best Finance Company Ltd and Chhyangdi Hydropower Company Ltd were the other losing stocks of the day. Among the companies publishing financial report for the fourth quarter, Womi Microfinance Bittiya Sanstha Ltd and Global IME Laghubitta Bittiya Sanstha Ltd reported a rise in their net profit by 86.97 percent and 40.54 percent, respectively. Mero Microfinance Bittiya Sanstha Ltd also published its financial report for the fourth quarter of FY2017/18, posting a slight improvement in its net profit. As per the ARKS technical analysis, the market corrected slightly after closing the previous session near the resistance of 1,200-point level. Hence, the market wiped all of previous day's gains with a bearish candlestick formation on Wednesday. The market has been trending in a narrow range, indicating indecision among investors. Furthermore, the volume has remained on the lower side and technical indicators also show an absence of substantial catalyst in the equity market.